I've been growing interested in how to use Kanban in the context of knowledge work and projects, so I took a quick scan through Kanban Made Simple by John M. Gross and Kenneth R. McInnis. This book is focused on shop floor Kanban systems, but I did learn a few things that are probably nothing new to people more well-versed in Lean. Some of the items that are helpful to me. Given my history, I obviously compare what I learn here to what I already know from my Theory of Constraints knowledge. The most important thing is that Kanbans are intentionally visible to the people who are executing the orders. This is what I'm most interested in: developing good mechanisms to make work visible to ones colleagues, whether that is at the personal level or for groups of people. Kanban is an execution system: it provides guidance on what should be done now and what is coming. A separate system must be in place to plan production. In TOC, most of the solutions contain both the planning (the drum schedule; the project plan) and execution (buffer management) elements. Initial Kanban sizing takes a number of factors into account, including a buffer concept. However, the buffers here are material buffers, whereas buffers in TOC are time buffers in most situations. This has an effect in the nuances of the execution, and I think the time buffers link to the planning activity. Similar to TOC, there is a red / yellow / green signalling system to help people prioritize if there happen to be multiple jobs at the same location. One of the key results of both Lean and TOC implementations is that there is less work in process (WIP). The authors mention that Kanban is an important element of making this happen within manufacturing settings. The Kanban system is an internal replenishment system, and as you shorten the replenishment times the WIP will drop. 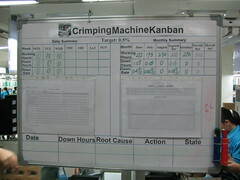 Continuous improvement is achieved by monitoring the Kanban process and mechanism. How often do are there stockouts or overstocks within the system? Are people following the Kanbans? etc. etc. (The authors describe this as "auditing" the system.) TOC also has a continuous improvement process, based around buffer management statistics.